That is, the data are stored as name-value pairs. In this case, each element in the array is actually a compound object consisting of two name-value pairs (Title and Count). We could have a simple list of single name-value pairs, or we could have deeper nesting of objects. There are various restrictions on the syntax for JSON objects, but as we’ll see, in MVC 4 you won’t usually have to write your own JSON, since there is a library routine that does it for you. Now that we know what JSON is, how do we use it as a mediator between a database and a web page in ASP.NET MVC 4? We’ve seen that the procedure for generating web pages in MVC is as follows. Write a controller that contains a method that is called when a client requests a web page from the server. Write a view that is linked to the controller method, and which generates the markup that is returned to the client. The controller method will usually collect some data from some other source, such as a database or some other C# code (which is usually part of the Model in MVC). This data is then packaged up, possibly in a C# object, and sent to the View, where the View formats the data and generates the HTML which is interpreted by the browser. Client requests a web page. Controller method is called to process this request. The corresponding View is returned to the browser. A different Controller method from that called in step 2 is called to generate the JSON, which is returned to the browser. The key point is that the JSON is not meant to be displayed as raw data by the browser; rather, it is retrieved by the browser and then processed on the client side before it is displayed. This controller uses the IComicRepository interface and ComicRepository class that we introduced earlier. This controller contains two methods of interest here. The one called JsonSummary() simply returns a View, which is the View that requests the JSON data (we’ll get to this View in a moment). That is, it contains two data fields named Title and Count. The second line in Summary() calls the library method Json() to create the JSON data. 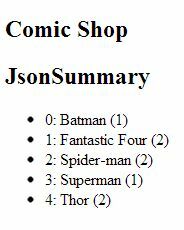 It is passed the list of ComicSummary objects in the variable summaries. The second parameter allows Summary() to provide JSON data in response to an HTTP Get request (by default, such a response is blocked for security reasons, so this parameter is needed). This returns the JSON string we gave above. That’s all there is to producing JSON data (as promised, you didn’t have to actually write any raw JSON yourself, since the Json() method does it for you). If you want to verify that Summary() actually works, you can call it directly from a web browser by using the URL http://localhost:36195/Json/Summary (the port number for your localhost server will probably be different; what’s important is the path /Json/Summary), and you should see the raw JSON data printed in the browser. Note that we did not associate a View with the Summary() controller method. As far as the browser is concerned, it is receiving raw text as a response to its request to Summary, so it just displays that. We need to do something special if we want it to interpret the JSON as data and incorporate it into a ‘real’ web page. To add in jQuery, right-click on the Solution in SolutionExplorer and select Manage NuGet Packages. Search in the Online section and find jQuery, then click Install. JSON should already be installed – you can check this by opening up References in SolutionExplorer and seeing that Newtonsoft.Json is included in the list. The call to the script is on line 9. The actual version number of jquery may differ from 1.8.2 if you install it later on, but just insert whatever version you got from NuGet. The argument ‘data’ sent to this function is the JSON code. This function then constructs an array called ‘items’ by iterating through ‘data’ using the jQuery $.each() method. The second argument to $.each() is another function, this time taking two arguments. The ‘key’ argument is the integer index of the element from ‘data’ that is being processed, and ‘val’ is that actual element from ‘data’. Remember from the JSON above that each element in ‘data’ is a compound object of type ComicSummary, so it contains a Title and a Count field. We access these fields to create a HTML list entry on line 6, and push this onto the items array.